• Design: This over-ear headset is designed by Kingston in Sweden. • Comfort: The material used in the manufacturing of HyperX Cloud Gaming headset is very light in weight and does not exert any pressure over the ears of the user. The leatherette padded ear cups and memory foam ear cushions provide utmost comfortable to ears. • Microphone: The detachable microphone gives you the option of using the headset without the microphone. • Drivers: The frequency response of the 53mm drivers is 15-25 kHz which generates sound of excellent quality. • Cables: The braided cables prevent it from tangling to each other. The cable also has along its length an inline volume and microphone mute controls. • Certification: HyperX is certified by TeamSpeak. This certification adds to the reliability of the product. 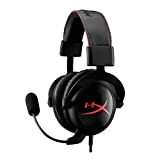 • Warranty: HyperX provide its customers with a fair enough warranty of two years. • Accessories: This product comes along with an airplane adapter, velour ear cushions and a mesh bag. • HyperX cloud gaming does not belong in a high price range. It is inexpensive and is a good bargain for gamers who like splurging on gaming accessories. It is the best gaming headsets under 100 dollars. • The production of sound is top notch. • It is very comfortable to wear and does not bother its user even if it is used for continuous long hours. • This device is capable to amplifies the overall sound quality. • It goes well along with PCs, tablets, mobiles, Xbox one, PS4 consoles, etc. • The cables are a bit too long. • The microphone is way too sensitive and it sometimes produces a kind of electro-static honking noise which is a bit annoying. • For people with big head, this headset can prove to be a little small to put on. • Chat boost: This headset uses dynamic chat boost technology which adjusts the chat volume level in accordance with the volume of the game. • Compatibility: Ear Force PX22 will work well with almost every device that you will connect it to. 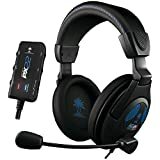 PS4, PS3, Xbox 360, PC, MAC and other mobile devices goes perfect with this headset. • Mix in music and answer calls: PX22 allows you to very conveniently plug the headphone cable to your phone and play your own playlist and answer calls while gaming. • Microphone monitor: The monitor enables you in customizing input voice volume. You can increase or decrease the volume of your voice in accordance with your need. • Customizable bass and treble: With PX22, you have the option to adjust treble and bass to a level which soothes your ear and enhance your auditory experience. • Speakers: The 50mm speakers generate an incredibly amazing sound of finest quality and clarity. You can hear even the minutest sound of footsteps of your enemy very clearly. • The dynamic chat boost feature of Turtle Beach Ear Force PX22 gives it an upper hand from the rest of its competitors. • Larger size headband makes it more convenient for people with big heads to wear. You can adjust the headband to perfectly fit your head. • Great compatibility with various devices is its plus point. • Exceptional sound quality. You cannot ask for something better than this. • The connection and set up required is very easy to do. • PX22 is very comfortable to ears. • RCA jack allows you to inline the headphones conveniently. • The microphone is just amazing in every aspect. From clarity to voice cancellation. It is simply excellent and have all the features to become the best gaming headsets under 100 bucks. • This headset being very versatile in its functions and compatibility has many cables to deal with. This is a wired device. A wireless version would have not created the problem of managing the cables. • This device floods in features which makes it popular among reputed gaming organizations and avid gamers. However the overall structural design is not well thought of. It could have been much better that don’t feels a bit awkward to the user.